What is it? Where is it? When is it? Where it going? ? This is one of H.L. Salmon’s pictures, taken near Tutbury, with No.1923 “Agamemnon” heading a Lowestoft-Liverpool service, probably summer 1923 with one coach in the new [LMS] colours. Moira was in the Leicestershire coalfield, I think, and “Moira” wagons probably spent most of their life either reasonably nearby or on Midland coal trains to London. Was the picture taken on the Midland part of the Lowestoft-Liverpool route? I think the chimneys in the background are the brickworks on the north side of the line just east of Tutbury station. 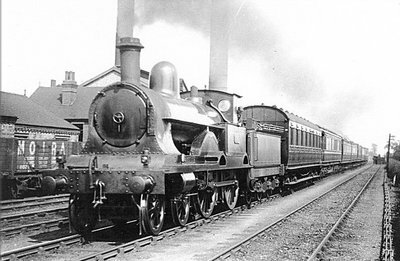 Although the scene seems to be pre-grouping, an LNWR engine hauling an LNWR train (except for one Midland Railway coach leading), the photograph was actually taken soon after the LMS was formed. The train is the return working of the ‘Eastern Counties Express’ on the first day it ran, 9th July 1923, and the engine is ‘Jubilee’ class 4-cylinder compound 4-4-0 No. 1923 Agamemnon, which was scrapped in March 1925, one of three ‘Jubilees' never converted to ‘Renown’. The ‘Eastern Counties Express’ had through portions from Liverpool (worked by the ‘Jubilee’) and from Manchester (worked by an NSR engine). The two portions were combined at Stoke-on-Trent, and the ‘Jubilee’ then worked the train forward, running non-stop to Nottingham, where an M&GN engine took over. The photograph shows the return working passing Tutbury, on the former North Staffordshire Railway. In later years the train ran in separate portions throughout, the Manchester portion taking the Churnet valley line.